Macey Hensley – The Ellen DeGeneres Show’s self-proclaimed “presidential expert” – was recently on board Carnival Breeze to check out all the fun features the ship has to offer. Decked out in her signature cowboy boots, the effervescent five-year-old had the time of her life on board. Macey’s adventure started with a visit to the ship’s WaterWorks aqua park, home to the massive 311-foot-long Twister slide. Of course, Macey couldn’t resist offering up a little presidential trivia, exclaiming that Franklin Roosevelt had a pool installed at the White House. She even got a chance to meet The Cat in the Hat and Thing 1 and Thing 2, part of Carnival’s fleetwide Seuss at Sea program. After playing a round of mini-golf and a game of bean bag toss with her newfound friends up on Lido Deck, it was the moment of truth – Macey was ready to brave the Twister! After donning her water wings – which, naturally, featured pictures of her favorite TV talk show host – Macey zipped down the corkscrew slide in style and was greeted by the Dr. Seuss characters as her exhilarating ride came to an end. 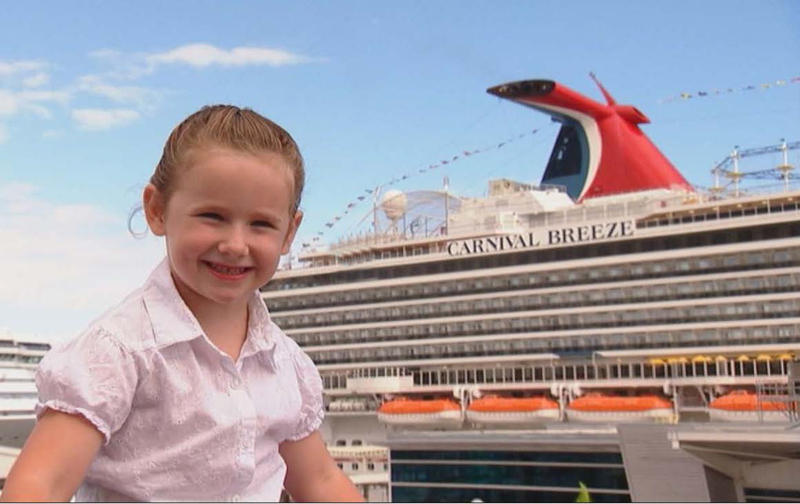 Alas, it was time to say goodbye but we’re sure Macey had a great time on board Carnival Breeze. Hope to see you again soon, Macey! The clip of Macey on the Breeze can be viewed here.